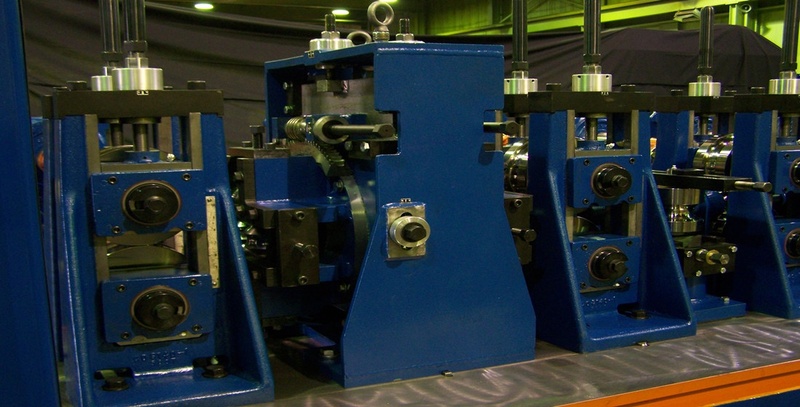 To eliminate the deformation by the internal stress which is created by the roll forming press. A straightener is generated. Usually, wide building sheets remain straight after roll forming. but most narrow steel profiles and especially asymmetrically roll formed steel profile will required a straightener. A straightener consists of support structures, rollers and also the adjust wheels. It is important that the roller fit to the steel profile section and is able to apply pressures on the bend or twist lines. To correct the deformation from the straightness of a bend line, the pressure is always apply to one direction at once. The straightener is always located between the cutoff blade and the last stands. And as closed to the last stand as possible. It is noticed that straightener is not a forming tool. so Believe Industry Company always adjust the roll forming mills to form the sections as straight as possible without a straighter. Double High Mill, which can produce 2 kinds of steel sheets without and change. Duplex Mill, which can produce various widths of steel sheets. Roll Forming transmission, an introduction of roll forming driven train. to help buyers know the different drives for different design of roll forming mill. More information, you also can call us or email us. Contact us for a future.